Hey HSPA+ 42Mbps doubters, RootMetrics says learn to love your T-Mobile 4G network because it’s pretty damn good. According to their study, T-Mobile is closer to AT&T’s LTE network than you might expect and definitely belongs in the top tier with Verizon’s and AT&T’s LTE networks. Their most recent study took a look at 42 markets for a combined 320,000 drive and indoor location data tests, using off-the-shelf consumer phones you can already buy from your carrier. 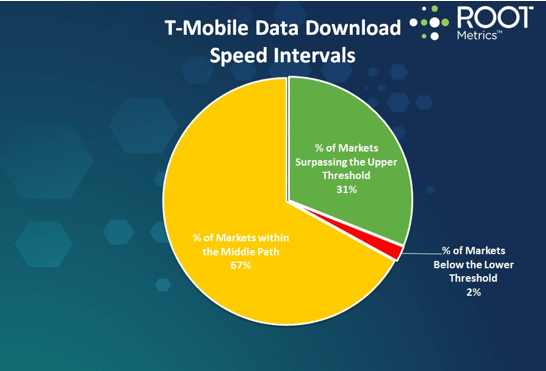 In order for a carrier to qualify as above the “upper threshold” in each market, the carrier had to deliver download speeds above 3Mbps in at least 70% of the tests for a given market. At that speed, it would take 10 minutes or less to download a 30-minute television show in standard definition and 10 seconds or less to download a music file. 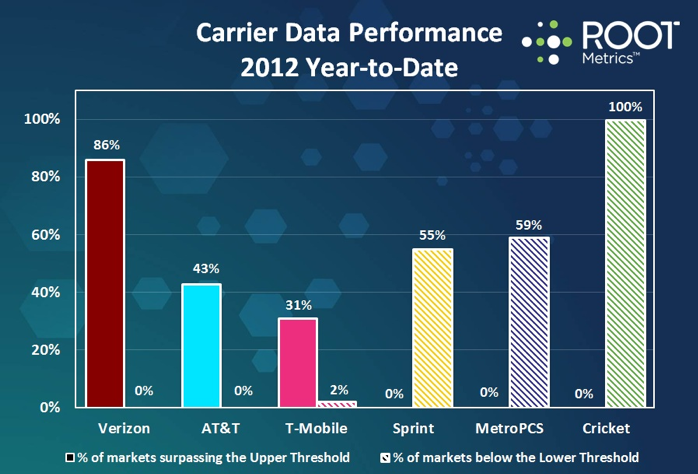 The “lower threshold” shows a carriers download speeds of at least 1.5% in at least 60% of the tests in a given market. The “middle path” indicates the percentage of markets in which a carrier neither exceeded the upper threshold nor fell below the lower threshold. As for Cricket, MetroPCS and Sprint? They didn’t even close to the scores obtained by AT&T, Verizon and T-Mobile. Sprint fell beneath the lower threshold in 23 out of 42 markets for a percentage of 55%. So how did RootMetrics rank all the carriers? but how will that change after sprint rolls out phase two of their lte? Sure….. it will. I wont hold my breath though. It will probably put us in 4th place until we roll out our LTE. When that happens, we will have the fastest 4G available at 72Mbps. …and big time bragging rights. What about the HSPA+ 84 they have talked about? Whenever that comes around, it will blow everything away unless everyone else steps it up by then. They scrapped the 84 in favor of LTE. Hopefully we will have at least a couple years in the lead with LTE before the top 3 advance past us again. Neville Ray said this earlier in the year, there is a lack of hardware support for 84 and it doesn’t make sense from an investment standpoint when LTE is clearly the smart road to take. As much as they scrapped HSPA+ 84, didn’t they say that they are still evaluating implementing it? No, they haven’t made any such announcements. 84 for now may function as an alternative to LTE when LTE isn’t available. It may replace 2G/Edge. I believe it’s 75mbps like verizon, right? I don’t think Sprint’s LTE will turn any heads. Apparently it’s going to be 5x5mhz implementation where Tmo, Vz, att, will all be doing 10x10mhz because they have more spectrum for LTE. I’m glad we’re going LTE. TMO is the Corvette of the wireless industry…best bang for the buck. Then Porsche and Ferrari will burn our asses. And the new ZR1 kills all of them…. IP Multimedia Subsystem is indeed VoLTE. why are people so excited about LTE? so we can have two half assed 4g networks that will never reach past the major cities. getting kind of tired being on edge. I hope your sitting in the middle of a major city otherwise good luck not only with the 4G but with a signal! I now know what is like to be one of the 2 percent.